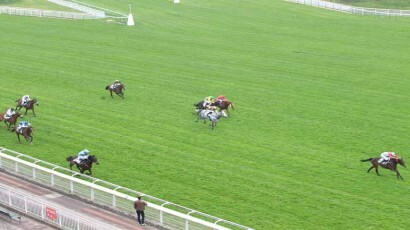 L’hippodrome de AUTEUIL accueille le Quinté du jeudi 12 avril 2018, le Prix Rose or no (R1C4). Cette course d'obstacles, d’une distance de 3 900 m, accueillera 16 chevaux pour une allocation de 100 000 €. Départ à 13h47. 1 Les Beaufs H9 8h (17) 2h 1h 2h 5h 9p (16) 0p 0p 4p 3p PAILLARD S. SEIGNOUX MME V.
2 My Maj H9 4h 6s 4s (17) 6s 3h 6s 0h 9s 5h 1h 3s (1 Mlle DESOUTTER N. FOUIN (S) Y. 3 Intrinseque H6 9h 8h 5s (17) 1h 1h 4h 1s 8h 5h 9h 7h 0h PHILIPPERON L. FERTILLET (S) Y. 4 Kami Kaze H7 0h (17) 9h 1h 3h 4s 9h 1h 2h 0h 0h (16) BURELLER E. RUDOLF GC. 5 Couteuse F6 (17) 1h 2h (16) 2h 5p 5p BEAURAIN T. FOUCHER F.
6 Angel'S share F5 1s (17) 6h 3h 1h 4h 3h 2h 1s (16) 3s Ts GUEGUEN MR T. NICOLLE F.
7 Cayo de Pail H9 2h 5h As (17) 2h 2s 0h 4h 5h (16) 4h (15 NATTIEZ J. BEAUNEZ B. 8 Deadheat H5 1h (17) 2s 2s 1h 3s 1s 5h 1h (16) 9h 6h DELAGE MR M. NICOLLE F.
9 Square Beaujon H9 4h (16) 1h 4h (14) 5h (13) 5s 3s 3s 3h 5 LECORDIER A. WINDRIF D.
10 Lovely Vallee F5 4h 4h 6h (17) 2h 1h Ah 4p 4h 1h 3h Th (1 JOUIN O. VIEL L.
11 La Limagne F5 4h 6h 1h (17) 1h 7p 2p 2p 5p 3p 2p 1p 1p POIRIER ALXI. VIEL L.
12 Eternal Army M5 4h Ah 2h (17) 1h 4p 0p 6p 2p 1p 0p 3p 9p ALAIN DE CHITRAY COTTIN (S) D.
13 Canitie F6 6s As (17) As 7h 1h 7h 3h 5h 1s (16) 9h LEFEBVRE MR C. DENUAULT (S) G.
14 Emilie Kap F6 7h 7h 5h 2h 4h (17) Th Ah Ah 8h (16) 1h LEFEBVRE M. LENOGUE P.
15 Pagomix H7 Ah 6h 4h (17) 1h 2h 3h Ah 9h Ah 4h 3h 7h MESCAM D. FERTILLET (S) Y. 16 Malak el Hawa H8 3h 3h 8h (17) 5h 5h 8h 3h 0h 2h 3h 0h 0p MERIENNE A. LENOGUE P.
Angel's Share (6) fait preuve d'une belle supériorité dans la phase finale de ce Prix Rose Or No.